BATON ROUGE, La. (AP) — Skylar Mays‘ soaring, one-handed, frenzy-inciting jam on a determined drive down the lane made it clear he won’t always be overshadowed by the highly regarded recruits that have made LSU basketball relevant again. Mays scored 19 points, transfer Kavell Bigby-Williams added a career-high 14, and No. 22 LSU held off a relentless effort by first-year coach Penny Hardaway’s Memphis squad, 85-76 on Tuesday night. Each of LSU’s three freshmen starters — Naz Reid, Ja’Vonte Smart and Emmitt Williams — scored 11 points. Williams also grabbed 10 rebounds for the Tigers (3-0), who trailed briefly with about 13 minutes to go before surging ahead for good with a pivotal 12-1 run that included back-to-back 3s by Mays and Reid. Smart set up Reid’s 3 with a behind-the-back bounce pass from the right wing. Memphis freshman Tyler Harris, who missed all six of his shots and didn’t score in his debut, was 6 of 13 on 3s and finished with 20 points in his second collegiate game. Jeremiah Martin scored 15 points and Kyvon Davenport had 10 for Memphis (1-1), which remained within single digits for most of the game. Mays scored from all over the court, mixing his crowd-pleasing dunk with his usual array of perimeter shots. He hit three times from 3-point range. LSU had trouble distancing itself from Memphis most of the night but appeared in control for most of the final 10 minutes, when its highlights included a roundhouse dunk from Williams and Reid’s double-pump, back-to-the-basket, no-look scoop off the glass that made it 74-64 with 4:35 to go. Memphis: The way Memphis played on the road against a ranked team provided an early indication that Hardaway’s first season at the helm could turn out better that the fourth-place finish predicted in the AAC preseason coaches’ poll. When Harris found his shot from the perimeter, it opened up opportunities inside for Davenport and Martin. 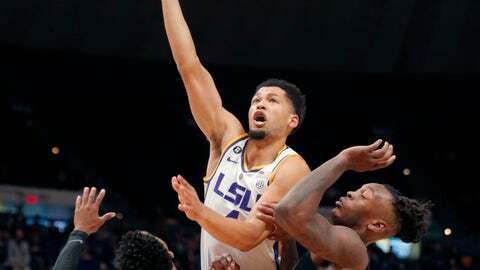 LSU: The Tigers’ dramatic upgrade in talent was evident in the fact they led 48-39 at halftime despite Tremont Waters, their best player from last season, not scoring at all to that point. Mays also asserted himself more, scoring more points in the first half than in either of his previous two full games. Waters finished with eight points and eight assists. LSU’s top freshman reserve, Darius Days, had nine points and six rebounds. Bigby-Williams, a 6-foot-11 transfer from Oregon, never scored more than 11 in a game for the Ducks. He’s expected to be relied upon primarily for defense this season, but made all seven of his shots against Memphis, including an emphatic dunk that gave LSU a 10-point lead with seven minutes remaining. Wade said Bigby-Williams’ perfect shooting night was indicative of his gritty, unselfish approach because he limits his shot-selection to high-percentage opportunities around the basket. Memphis hosts Yale on Saturday night. LSU hosts Louisiana Tech on Friday night.